As it was heading into March, it was once again time for the Luton Hoo walled garden exhibition with a possible entry of 5 pictures. 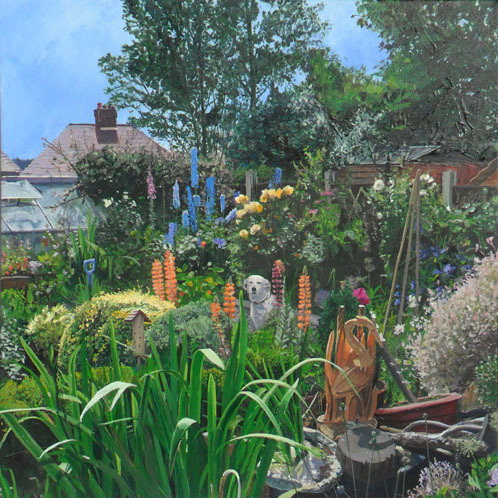 I felt that only one of my existing pictures “ View from the Deck” fitted the brief which this year was “The Garden and Beyond”. I’m not sure if this title was aimed at extending the scope of entries to landscapes (which have been commonplace in previous years anyway) but I liked the idea of being quite literal about it. In the case of “View form the Deck”, the scene is looking out over various gardens to the sea beyond. Of course the deadline for submitting the title came before I had much paint on canvas. Although “The Empty Birdfeeder” was not finished first, It was nearly there in time for title submission – which meant it had an apt title. Unfortunately the same could not be said for “The Garden and Beyond”. The white dog was added at a late stage and gave the whole a centre of attention. Although I don’t mind the title, I think the dog needs a mention in it in some way. – “It’s my Garden” perhaps. Having a balanced composition with the photo, I did minor alterations like to remove some bird feeder poles, and wire border fencing in a couple of places. I lost a tree in the top left corner just to make it slightly simpler, though I am still undecided weather this was correct. The dog was from a Restaurant in Dorking, while the scene as a whole is Belper. From a ‘get the paint everywhere quickly’ stage, I then was more meticulous working from top to bottom. This seemed a fairly straight forward process and indeed quite absorbing. So much so that I worked to completion rather than working on the other works simultaneously as I have done in the past.